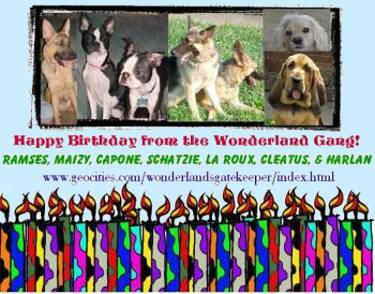 Congratulations Maggie On Your 5th Birthday!!!! 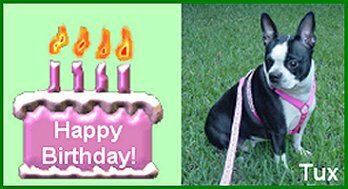 Maggie's Birthday was on April 23rd, 2002! 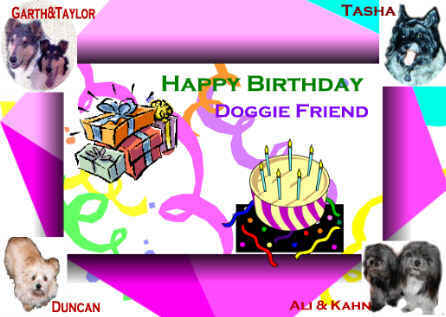 Shihtzu 'LICKS' Kahn and Ali"
"Have a great day Maggie, we will be howling our happy birthday song along with all the others. Our wishes for a pawsitively grrrrr-8 day. 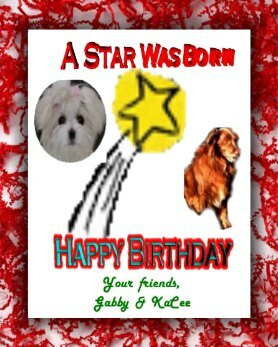 Your Dog Friends, Gabby and KaCee"
"Miss Tuxie Girl sends very special birthday greetings from Montgomery, Alabama. and lots of belly rubs. It's great sharing the same birthday as you! Make sure you get all the doggie treats you could ever want.
" Have a blessed day! May God Bless You! 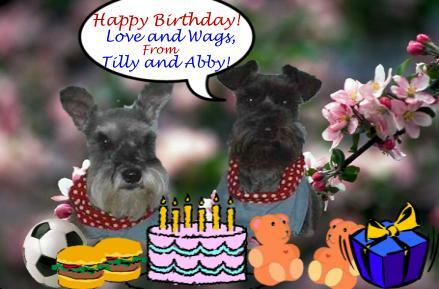 Tilly and Abby"
"Have a great day, Maggie!